For many, To Kill A Mockingbird holds a special place in their heart. It is a story which transcends generations and continents, and could accurately be described as one of the great American novels. In Mary McDonagh Murphy's book she compiles interviews from those connected to the story directly and indirectly including Mary Badham, the young girl selected to play Scout in the film adaptation, and Harper Lee's older sister Alice. Also included are interviews from many writers who mark out Lee as an influence on their own work and marvel at the exceptional piece of literature she created. For lovers of the novel, there is much to enjoy in this celebratory offering, as authors profess the reasons for their lasting relationships with the story. From reading it as a manual on parenting, to a guide on how to be an independent woman in the southern states, the messages taken away from Harper Lee's novel are broad ranging. The novel is also well contextualised in the history of the civil rights movement with several interviewees offering Lee credit for her contribution to the fight for equal rights. 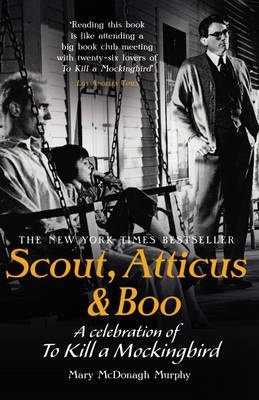 Overall Scout, Atticus and Boo offers enjoyable insights into the reasons for the success of To Kill A Mockingbird, and may just cause you to go away and read the book all over again.